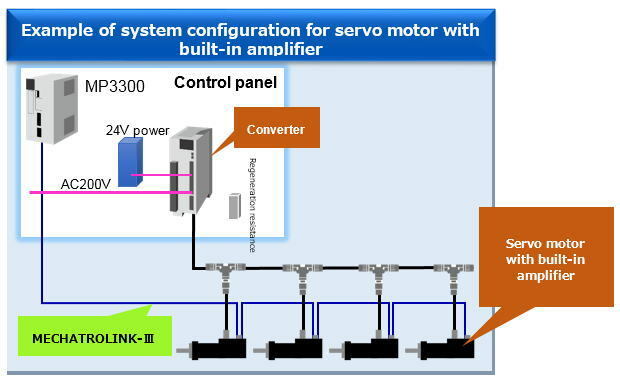 Yaskawa Electric Corporation (Representative Director and President: Hiroshi Ogasawara) is pleased to announce that it has developed the world’s first servo motor with built-in amplifier that is equipped with GaN* power semiconductors and has begun sales as of May 23, 2017 as the latest addition to its AC servo drives Σ (Sigma)-7 product series. By combining the servo motor and servopack features which have comprised servo drives to date, the servo motor (Σ-7 F model) with built-in amplifier has been made half the size compared with the amplifier portion of the conventional servopack, making it possible to offer smaller and more efficient servo drive systems for customer devices and control panels. * GaN (gallium nitride) is a compound of Ga (gallium) and N (nitrogen). Compared to Si (silicon) semiconductors, power semiconductors which use GaN materials enable work in high temperatures, have a strong rate of dielectric breakdown electric field strength, offer a higher rate of saturated electron mobility and electron mobility compared to power semiconductors that use SiC materials. 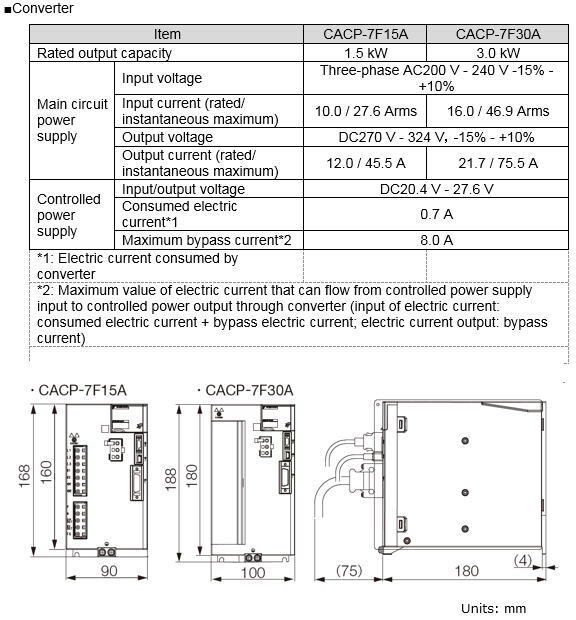 Due to these advantages, including high-speed switching capacities, it has high expectations for applications for power semiconductors. Low-loss GaN power semiconductors have reduced losses in the amplifier and motor, even in high-frequency drive, and improved input and output efficiency. The amplifier portion has been made smaller through the use of a high heat dissipation structure, making it possible to embed it within the servomotor. In the multi-axis servo system the multiple servo amplifiers in the control panel are replaced by a convertor, making it possible to make the control panel smaller. 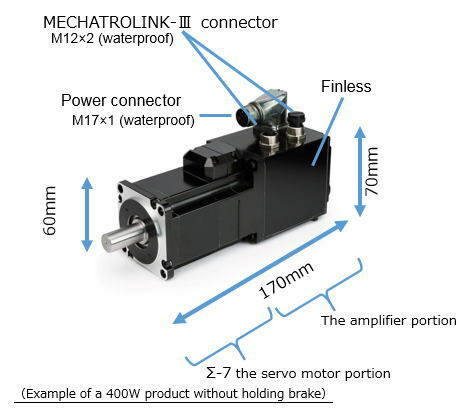 Through a multidrop connection for power and a daisy chain connection via MECHATROLINK-Ⅲ for control it is possible to lengthen the overall wiring and reduce the space required for wiring. The high-frequency drive that exceeds audible frequency range enables a reduction of irritating high-frequency noise released by the servo motor. As the DC link enables multiple connections, the regenerative energy may be used for other servo motors with built-in amplifier in a multi-axis system with multiple servo motors. As the amplifier portion is waterproof (IP67) like the motor portion, it is possible to use with a waterproof connector in an environment where water is used. 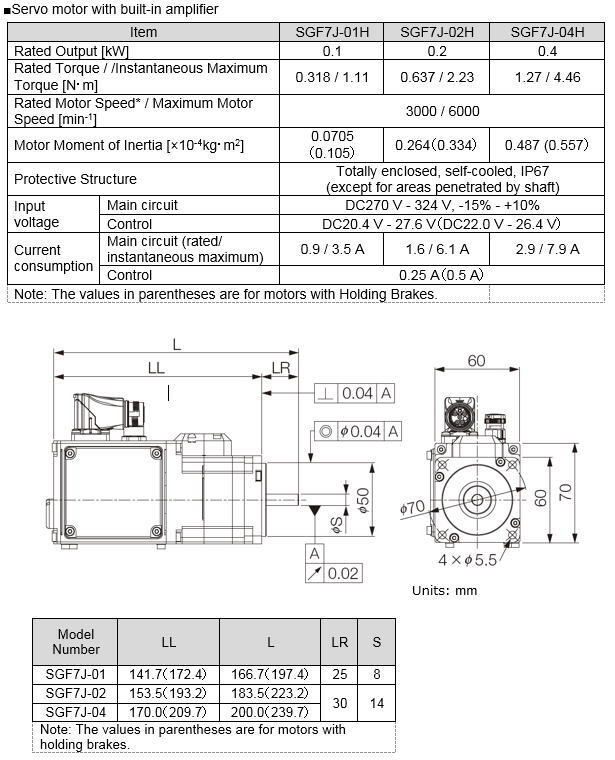 Note: A maximum of up to eight servo motors with built-in amplifier may be connected to the converter (variable depending on length of cable and capacity).